And they became a henge. Then the spirits intervened (it is a wine rack after all) and the sunlight reflected of the car window shone directly through the southern trilithon. A clear message that the Mayans were wrong and the world will go on after the winter solstice. This is my first entry in the Clonehenge End of the World Festival contest as announced on October 23, 2012. Life is Good. You can see more of my hengish contributions here. Stonehenge Under Water, and Clonehenge’s Fourth Birthday! On the 20th of November, 2008, Clonehenge first appeared online. Posts were short, and we often did two or three a day. Four years later, here we are, doing fewer posts and longer, but still plugging away. Happy birthday to us!! That Clonehenge goes on at all is remarkable, and fun. Thank you to all (three?) of you for your interest and support! For our birthday post we have chosen to tell you about the first large underwater Stonehenge, one that is still in planning stages, a limestone reef in the form of Stonehenge, to be built for the enjoyment of undersea organisms and human divers by Reef Builders International, LLC. (Beware of that site–egregious use of Flash!) These people also built the Atlantis Reef Project, aka Neptune Memorial Reef, a place for burial at sea that is fancifully made to look like the lost city of Atlantis. We say this is the first large underwater Stonehenge because unsurprisingly a five minute search turns up three different companies (here’s one) that make Stonehenge-style decorations for fish aquariums (aquaria? ), which means there are bound to be more somewhere. People have been doing small underwater Stonehenges for some time. Perhaps it’s an echo of the future time when Stonehenge itself will be underwater! 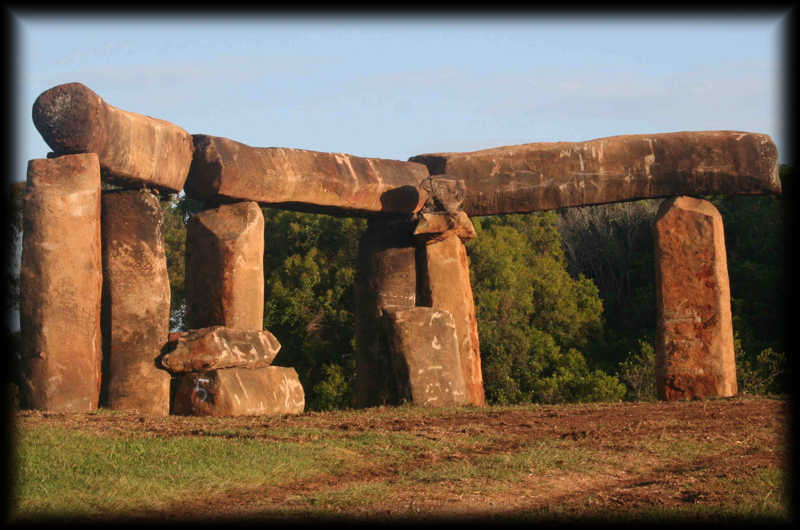 Since Clonehenge began, we have brought you tiny Stonehenges, huge Stonehenges, edible Stonehenges, Stonehenges of many ridiculous materials, scientific Stonehenges, artistic Stonehenges, illegal Stonehenges, pink Stonehenges, white Stonehenges, and Stonehenges in Australia, Europe, Japan, China, Africa, South America, North America (of course! ), and several in Antarctica. We still haven’t had a real Stonehenge replica in space, something we still greatly desire, but this is almost as good–a Stonehenge in the ocean! People are strange and, reluctant as we are to admit it, kind of brilliant. We can’t wait to see those lentils. This Stonehenge will not only be recreational but in a pinch it could feed thousands!! Thanks again to our readers (surprisingly many), and our critics (surprisingly few), to our Hengefinders, and to WordPress.com, and of course to those crazy hengers of every stripe. We are grateful for four fun years! A pity the world only has a month left. We were just getting started.